Do you love both the purple of Amethyst and the sunny gold of Citrine? Sometimes Amethyst and Citrine colors are found in the same crystal of quartz. Purple and yellow are complementary colors: Opposites on the color wheel that combine in surprising harmony. Think of the cheerful beauty of purple and yellow pansies or the elegance of a violet and gold iris. The Quartz gems of Amethyst and Citrine, purple and yellow, sometimes combine into a single two-tone gemstone called Ametrine. These bicolor yellow and purple Quartz gemstones are fantastic. With Ametrine, you can have both gem colors for the price of one! Ametrine is especially inexpensive when you consider that it comes from only one mine in the world. Ametrine is a naturally occurring variety of Quartz. It is a mixture of Amethyst and Citrine gemstones with zones of purple and yellow or orange. Almost all commercially available A metrine is mined in Bolivia, there are also deposits being exploited in Brazil and India. The Anahi Mine in Bolivia is the major world producer of Ametrine. The mine first became famous in the seventeenth century when a Spanish conquistador received it as a dowry when he married a princess from the Ayoreos tribe named Anahi. 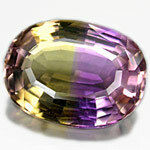 Ametrine was introduced to Europe through the conquistador's gifts to the Spanish queen. The color of the zones which are visible within an A metrine gemstone are due to differing oxidation states of iron within the crystal. The different oxidation states occur due to there being a temperature gradient across the crystal during its formation. Artificial Ametrine can be created by differential heat treatment of amethyst. The trade name is Bolivianite . Ametrine is most typically faceted in a rectangular shape with a 50/50 pairing of Amethyst and Citrine. Sometimes a checkerboard pattern of facets is added to the top to increase light reflection. Ametrine can also be cut to blend the two colors so that the resulting stone is a mix of yellow, purple, and peach tones throughout the stone. Ametrine – Bolivianite - is also popular among artistic cutters and carvers who play with the colors, creating landscapes in the stone. 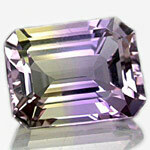 Ametrine is a very durable gemstone suited for a variety of jewelry uses. Most sizes and shapes are available but the color contrast is most pronounced in sizes over seven carats. So why compromise when you can have two varieties of Quartz for the price of one!